Rest in Peace brave hero. Our thoughts and prayers are with Sgt. Joshua Lengstorf’s family and friends. To read more about Joshua please see the article in the News Review where this photo was hosted. Q Madp IraqWarHeroes.org was on hand to take photos of this Hero’s return. via Many Turn Out to Honor NW Defense Contractor Killed in Afghanistan – Salem-News.Com. PORTLAND, Ore. — The Oregon National Guard has identified two soldiers killed when a convoy they were guarding was attacked in Iraq. Pfc. Taylor D. Marks, 19, and a decorated veteran, Sgt. Earl D. Werner, 38, died Aug. 28 when the convoy was struck by an explosively formed penetrator, or EFP, an armor-piercing explosive that turns into a projectile when detonated. Werner was on his third deployment with the Oregon National Guard. He had been awarded the Bronze Star, two Army Commendation Medals and the Combat Action Badge. He is survived by his wife Casey and son Charles of Amboy, Wash.
Marks, of Monmouth, was a graduate of Central High School. He is survived by his parents and stepfather, and his sister and brother. Both were serving with the 41st Special Troops Battalion, 41st Infantry Brigade Combat Team. MONMOUTH, Ore. — Relatives of an Oregon teenager killed in Iraq remember Taylor Marks as a young man who didn’t want to go into debt, so he went into the National Guard. His stepfather says the 19-year-old from Monmouth planned to go to the University of Oregon to study finance and Japanese. He decided to join the Guard to raise college money. Marks was guarding a convoy Aug. 28 when an armor-piercing projectile struck. He and 38-year-old Sgt. Earl Werner of Amboy, Wash., died. They are the first fatalities in the deployment of about 2,400 Oregon-based soldiers this summer. Marks was born in Salem and raised in Monmouth. On the night of his high school graduation, in late May 2008, Marks told the Statesman Journal that he planned to continue working at his job at a Chevron station, then enter the National Guard in August. “I’m a little bit nervous, but I’ve got some big plans to look forward to,” Marks said then. He ended up going to National Guard training with a friend. The Oregon Military Department said he was contracted to go to the Defense Language Institute at the Presidio in California, but made the decision to defer his schooling to deploy with the 41st Infantry Brigade Combat Team. The military department says he has been promoted posthumously from private first class to specialist. Werner, 38, was on his third deployment with the Oregon Guard. He had won the Bronze Star, two Army Commendation Medals and the Combat Action Badge. A third soldier, 24-year-old Specialist Reid Walch of Redmond, was seriously wounded by shrapnel. He was evacuated to a combat support hospital for treatment, Capt. Stephen Bomar said. Soldiers’ Angel Cynthia is a part of theLiving Legends team, which provides condolences and comfort to families of the fallen through letters, cards, and very special gifts of comfort and remembrance. Cynthia is personally responsible for contacting families and offering them a tree or wreath in memory of their loved one. She also makes sure any young children involved receive a Patches teddy bear, which is specially crafted to help them express their emotions amid the tragedy of losing a parent. …After talking with family after family the last few days, I thought it was time to make sure each and every one of you understands how very important you are and what a special thing it is you are doing. Mother after mother, wife after wife, father after father, and husband after husband have told me how much those cards mean to them. Not once in the two years I have been doing this have I ever had to explain Soldiers Angels to any of our families–each and every person knew, and the appreciation is so enormous. One Grandfather told me this weekend that we have done so much for them that they hated to impose anymore by taking a tree. I’m told over and over how amazed they are that people all over the country–people they don’t know–would be so kind, go to such trouble for them. Each of you, when you send a card, is a wonderful ambassador for Soldiers Angels and you make my job at little easier. Some families have told me that at especially rough times, they go back to their box of Angel cards and read them again for comfort. It doesn’t matter that none of us have the perfect words–when I call, I certainly don’t because there simply are none–but the fact that you reach out to them means so much, they are so grateful that people care; you just can’t imagine. So, if ever you feel that your one card doesn’t matter, that you can’t possibly say anything that will make a difference, don’t you dare stop! You are a lifeline to so many, and those cards and letters will carry into the future. 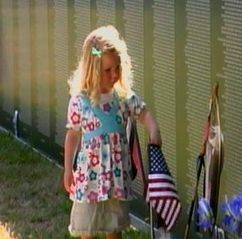 Sadly, many of our heroes have children they never met or who are too young to remember who Mom or Dad was. Your cards are being kept to give to those children and hopefully your words will help these children fill that empty place with the understanding that Mom or Dad was very special–so special, so appreciated, that people from all over the States wrote to say so. So, thank you again. I, too, appreciate the caring and thoughtful way you pave the road for me. The bios [on each fallen hero, researched and assembled by Living Legend team members] are so helpful to me because I can read each one, and when I talk to one of our families I know something about them, which makes me a little more like a long-lost friend that a stranger. Plus, I see the photos and sometimes it helps me know what to say. I know putting those bios together is not an easy job, reading them isn’t easy either and you know what?–It really shouldn’t be. Soldiers’ Angels proudly gives its most respectful salute to the amazing Angels of the Living Legends team. They willingly step into the most painful of situations, honoring America’s heroes and comforting their grieving families during the most difficult time. They are truly Angels of a most special breed. Found this article in the Salem-News by Tim King Wish I had been there, but would love to hear from those who made the trek. ALBANY, Ore.) – A spectacular tribute to the nation’s military was in Albany last week at Timber Linn Park, which already has an area dedicated in honor of American veterans. 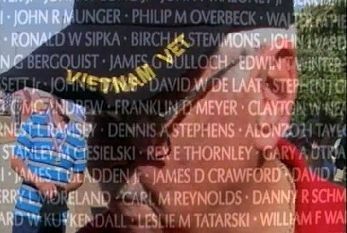 A miniature but complete version of the Vietnam Wall in Washington D.C. was constructed on the Albany park grounds and thousands made the trip to pay honor to those who paid the ultimate sacrifice while fighting in the Vietnam War. Accompanying that tribute are panels of dog tags of Americans killed in Iraq and Afghanistan. That honor extended to include all veterans, and the top phrase just might have been, “Welcome Home”. It sounds good to anyone who has ever been to war. The event is the brainchild of a WWII Navy veteran named Garner Pool, who says he complained until people listened, and eventually reconstructed the park to honor veterans, specifically from Linn County, Oregon, but also all wars. Several hundred motorcycles escorted the Wall to the park and local residents put it all together. One of the event’s organizers, Tanya Kramer, says everyone that pitched in was either a veteran, or a family member of one. “It’s a big family of really great people,” she said. A local Marine Corps recruiter, Sgt. Charles Bates, told Salem-News.com it was an honor to receive a special medal being issued to Oregon veterans, alongside people who fought in previous wars like Vietnam. 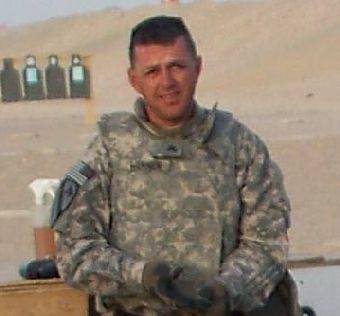 Bates has served two tours in Iraq. Saturday, July 18th, was the biggest day for the event, and it was open 24-hours a day once constructed. A fly-by Saturday afternoon passed in a missing man formation, signifying the loss of an aviator. It is a sobering reality check, along with the bagpipes and the 21-gun salute, that leaves few eyes dry. A Moment of Silence was started to honor every American service member Killed-in-Action during Operation Enduring Freedom and Operation Iraqi Freedom with a Moment of Silence from this day forward. Every Monday from 6:00-6:01 PM (CST) we ask that you pause for a Moment of Silence for our heroes that have been Killed-in-Action. The first listing is in full- the second listing is Twitter compatable. Please Retweet. Also hit the share button to share this list with others. RIP: Spc. Herberth A. Berrios-Campos, 21, of Bealeton, Va., died July 24 in Salman Pak, Iraq, of injuries sustained from a non-combat related incident. He was assigned to the 1st Battalion 505th Parachute Infantry Regiment, 3rd Brigade Combat Team, 82nd Airborne Division, Fort Bragg, N.C.
RIP: Marine who were supporting Operation Enduring Freedom. Lance Cpl. 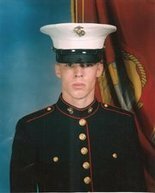 Jeremy S. Lasher, 27, of Oneida, N.Y., and Cpl. Nicholas G. Xiarhos, 21, of Yarmouth Port, Mass., died July 23 of wounds suffered while supporting combat operations in Helmand province, Afghanistan. They were assigned to the 2nd Battalion, 8th Marine Regiment, 2nd Marine Division, II Marine Expeditionary Force, Camp Lejeune, N.C.
RIP: Sgt. Ryan H. Lane, 25, of Pittsburgh, Pa., died July 23 of wounds suffered while supporting combat operations in Helmand province, Afghanistan. He was assigned to the 2nd Light Armored Reconnaissance Battalion, 2nd Marine Division, II Marine Expeditionary Force, Camp Lejeune, N.C.
RIP: Soldiers who were supporting Operation Enduring Freedom. They died July 22 in Zabul Province, Afghanistan, of wounds suffered when an IED detonated near their vehicle. They were assigned to the 4th Engineer Battalion, Fort Carson, Colo. Killed were: Sgt. 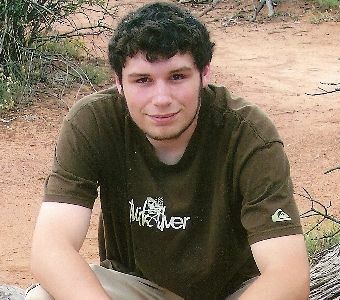 Joshua J. Rimer, 24, of Rochester, PA., and Spc. Randy L.J. Neff, Jr., 22, of Blackfoot, Idaho. RIP: Spc. Raymundo P. Morales, 34, of Dalton, Ga., died July 21 in Methar Lam, Afghanistan, of injuries sustained during a vehicle roll-over. He was assigned to the 148th Brigade Support Battalion, Cedartown, Ga.
RIP: Four soldiers who were supporting Operation Enduring Freedom. They died July 20 in Wardak Province, Afghanistan, of wounds suffered when an improvised explosive device detonated near their vehicle followed by an attack from enemy forces using small arms and rocket-propelled grenade fires. They were assigned to the 4th Battalion, 25th Field Artillery (STRIKE), 3rd Brigade Combat Team, 10th Mountain Division (Light Infantry), Fort Drum, N.Y.
Sgt. Gregory Owens Jr., 24, of Garland, Texas. Spc. Anthony M. Lightfoot, 20, of Riverdale, Ga.
Spc. Andrew J. Roughton, 21, of Houston, Texas. Pfc. Dennis J. Pratt, 34, of Duncan, Okla.
#MilitaryMon Moment of Silence 6-6:01 pm CST: Cpl. Nicholas G. Xiarhos, 21, of Yarmouth Port, MA 7/23 in Helmand, ASTAN. Camp Lejeune, N.C.
#MilitaryMon Moment of Silence 6-6:01 pm CST: Lance Cpl. Jeremy S. Lasher, 27, of Oneida, N.Y 7/23 Helmand, ASTAN. Camp Lejeune, N.C.
#MilitaryMon Moment of Silence 6-6:01 pm CST: Sgt. Ryan H. Lane, 25, of Pittsburgh, Pa., 7/23 in Helmand, ASTAN. Camp Lejeune, N.C.
#MilitaryMon Moment of Silence 6-6:01 pm CST: Sgt. Gregory Owens Jr., 24, of Garland, TX 7/20 in Wardak, ASTAN. Fort Drum, N.Y.
#MilitaryMon Moment of Silence 6-6:01 pm CST: Spc. Anthony M. Lightfoot, 20, of Riverdale, Ga. 7/20 in Wardak, ASTAN. Fort Drum, N.Y.
#MilitaryMon Moment of Silence 6-6:01 pm CST: Spc. Andrew J. Roughton, 21, of Houston, TX 7/20 in Wardak, ASTAN. Fort Drum, N.Y.
#MilitaryMon Moment of Silence 6-6:01 pm CST: Pfc. Dennis J. Pratt, 34, of Duncan, Okla. 7/20 in Wardak, ASTAN. Fort Drum, N.Y.